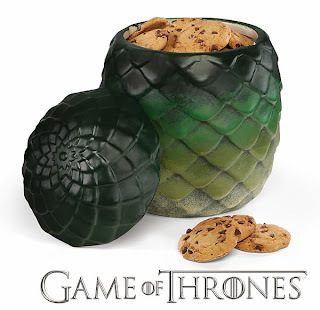 If you have a Game of Thrones fan on your list this year, then head on over to (where else) ThinkGeek and check out this completely nerdtastic Dragon's Egg Cookie Jar. This green, ovoid canister looks so innocent. People not familiar with Game of Thrones might ask you why you have a huge artichoke on your counter. And at that point, you can turn on them, eyes flashing, and quietly utter the words, "How DARE you insult my dragons." I think it might also make the perfect gift for a red wedding ;) Sadly, it's sold out but you could always buy your giftee a ThinkGeek Gift card or an IOU. Because not fulfilling your promises really goes over well with those Lannister types.